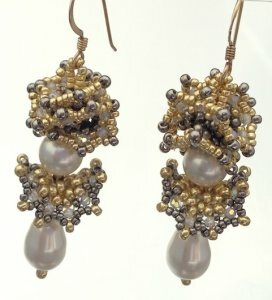 By combining different shapes and sizes of tiny seed beads, you can create three-dimensional shapes in twisted forms allowing the tension to guide you. This is the essence of my art. Explore a world of sculptural stitching. 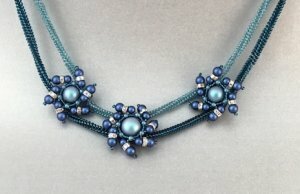 Browse the bead kits, check out my calendar of upcoming classes and see BEADING ACROSS AMERICA a publication which I illustrated featuring 30 different seed bead projects from leading artists across the nation. Let this web site be your guide into the world of dimensional off-loom bead weaving. View my photos and enjoy the essences of the sculptural form created in every piece. I added four patterns: Circles and Spirals, Nestled Pods Bracelet, Spiral Waves, and Spike Me! I also reduced the prices of some of the older patterns. This is a wonderful event and a great bargain. I am teaching along with Amy Katz and Diane Dennis. To see the classes and get more info at NVBS.org. On Saturday November 17th, 2018, I will be at Kits and Caboodles at Bead Soup in Savage, MD. 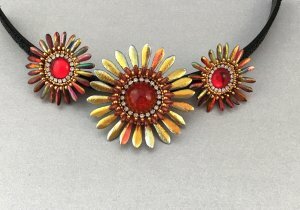 I will have my kits, vintage Swarovski beads & cabs, vintage cabs, and cup chain.